Riceviamo da un amico greco e – consapevoli del rischio di impopolarità – pubblichiamo. Anche perché lo stesso potrebbe accadere in Italia nella malaugurata (e per fortuna improbabile) circostanza di un risultato importante di M5S alle prossime elezioni politiche. Please allow me to explain to you what has been happening to my country in the last few months and how a group of left-wing fanatic ideologues, extremists and opportunists, allied with racists, anti-Semites and neo-Nazis have been leading my nation towards an economic and political Armageddon. On January 25, after 5 years of economic recession, two bailout packages by the European Union (EU), the European Central Bank (ECB) and the International Monetary Fund (IMF), an unprecedented unemployment rate that today exceeds 27% and a significant loss of the average household income, the Greek people (unwisely) decided to vote into power the Radical Left party of SYRIZA. SYRIZA is comprised of Marxist, Stalinist, Trotskyist and Maoist Communists, Anarchists, lots of opportunists without a clear ideology and Socialists, leftovers from the, once powerful, Socialist party of Greece. Before the elections, SYRIZA exceeded in populism any political campaign in living memory. They literally promised everything to everyone. They took advantage of people’s despair and anger against the traditional, mainstream political parties that are, to a large extend, responsible for the Greek economic crisis. However, in every chance, they confirmed that they would not risk the country’s membership in the Eurozone and the EU. The party’s leader and current Prime Minister, Mr Tsipras, in his teens and early twenties, was a member of the Orthodox-Stalinist Communist party of Greece and has not worked a single day in his life. His coalition government partner is a right wing, extreme populist, anti-Semitic, racist, homophobic, psychopathic party, the Independent Greeks, led by an insane fellow who believes in Chemtrails and other conspiracy theories (I kid you not!). He also believes that Greece can seek financial support from countries, such as Russia, China and Iran. Before 2010, these parties would barely enter parliament reaching the 3% threshold of the popular vote. Exactly like in Germany in the interwar period and for the same reason (an economic depression), extreme parties have flourished and populism has triumphed in Greece. SYRIZA became the first party with 36% of the popular vote and the Independent Greeks gained another 5%, giving them a parliamentary majority. What followed was 5 months of so-called negotiations, during which the Minister of Finance, Mr Yanis Varoufakis, a Professor of Economics, specialized in Game Theory and with an endless appetite for personal publicity, changed his position on a weekly basis and proposed to the Eurogroup (the Eurozone Finance Ministers’ assembly) unachievable economic targets for an economy that was back into recession after a trimester of economic growth in late 2014. In the meantime, in Greece, the new coalition government increased public spending by hiring thousands of their people into the public sector. This completely derailed the economy and resulted in a new deficit of more than 5 billion euros. Additionally, there was a widespread media campaign to present the EU, the ECB and the IMF as bloodthirsty monsters that hate the Greek people and wish to starve and humiliate us. A lot of people in Greece actually BELIEVE that this is the true intention of our EU partners! Political parties, politicians, journalists or even regular citizens, like myself, who defend a United Europe and wish us a part of the Eurozone are characterized as “traitors” and “enemies of the people”. 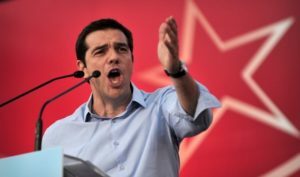 On Friday, June 26, Mr Tsipras, after failing to reach a compromise with the EU and the IMF, called a snap referendum for Sunday, July 5, in which he is asking the people to vote YES or NO to the following question: “Do you approve the technical proposal of the Creditors of Greece (i.e. the EU, ECB and IMF) for the extension of the bailout programme?” This proposal, submitted to the Greek government a few days ago, includes reduction of public spending, increase of the VAT and liberal economic reforms. Keep in mind that increased taxation was proposed to our Creditors by the Greek government itself! The question of the referendum is dishonest and deceiving. The average citizen, misinformed and confused from five months of conflicting information and the anti-European rhetoric of the coalition government, largely unaware of the dire situation of the economy and the consequences of his vote, angry by increased taxes and pension cuts, will naturally vote NO. The actual question that needs to be answered is whether the people want the country in the Euro with reforms or a National Currency without reforms. Of course the coalition government will not put the real question to the vote, they would never take responsibility, they will always blame “the others”. What the Greek government does with this referendum is nothing less than a political extortion towards the entire EU. On Saturday, June 27, this extortion was put on a vote in the Greek parliament and won a majority support by the MPs of the Radical Left party, its right-wing populist partner and the far-right racist Neo-Nazi party, Golden Dawn (the shame of my country, or at least one of the recent shames). This broad anti-European coalition is officially leading my country into the abyss of extremism, populism, international isolation and bankruptcy. This should not come as a total surprise. Mr Tsipras and many SYRIZA party-members have declared, more than once, that Venezuela should serve as “a model of Democracy for Greece”. SYRIZA recognizes its ideological counterparts in Latin-American Socialist semi-dictatorships. Mr Tsipras and his party, together with their lunatic partners, deceived the Greek people with false promises and stole the popular vote. They then bombarded the public with a coordinated anti-European campaign of lies. Now, they are playing their last card to take Greece out of the Eurozone and the European Union. This is their target. This was their target from the beginning. They are not Democrats, they are Fascists. They were always Fascists. And they want to bring down Democracy in its birthplace. Please share this message and inform your friends about what is really happening in Greece and what is at stake. Pingback: δημοκρατία | Notiziole di .mau.